President Donald Trump has threatened to cut financial aid to Honduras over a large group of migrants heading towards the US border. In a Tweet posted on Tuesday, Mr Trump said the country's president was told funds would be cut "immediately" if the group was not stopped and returned. Honduras has a long history of poverty and corruption. It also has one of the highest murder rates in the world. The group of at least 1,500 migrants grew rapidly in size over the weekend. 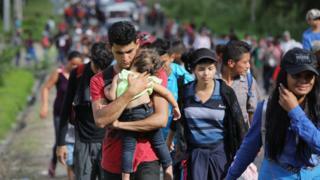 Mr Trump later also warned Honduras's neighbours, Guatemala and El Salvador, that their governments could face their funds being cut if they allowed the migrants to pass through their countries on their way north. About 160 people originally set off on Friday from San Pedro Sula, a notorious Honduran crime hotspot. They pushed across the border into Guatemala on Monday, despite a heavy police presence and government order attempting to block their route. 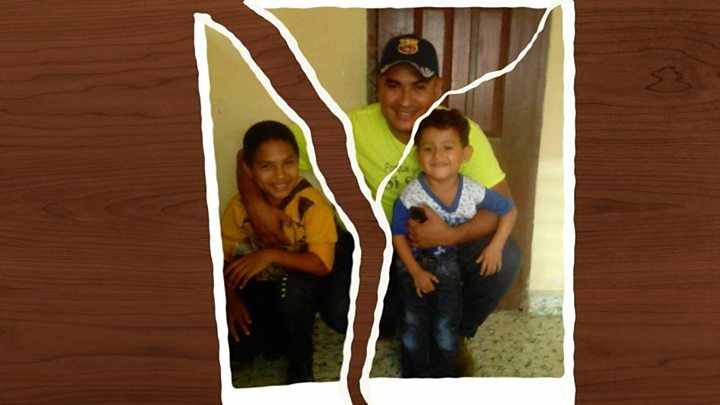 Shortly after Mr Trump's tweet, it was reported that Bartolo Fuentes, one of the caravan's organisers and a former Honduran legislator, had been detained by Guatemalan authorities to be deported back to Honduras. This is the second time Mr Trump has threatened Honduras's aid over migrants, in April saying it was "in play" over another group. The US sent more than $175m (£130m) to the country in 2016 and 2017, according to the US Agency for International Development. Officials in Mexico and the US have been monitoring the migrants, who have formed what is known as "a caravan", over the past few days, and issuing warnings about their rights to enter their countries. Last week, Vice President Mike Pence urged Central American countries to do more to prevent mass migration. "Tell your people: don't put your families at risk by taking the dangerous journey north to attempt to enter the United States illegally," Mr Pence said. In a statement issued on Tuesday, the Honduras foreign ministry urged its citizens against joining the caravan, dismissing it as a political ploy to " to disrupt the governability, stability and peace of our countries". Why did they leave Honduras? Honduras, which has a population of about nine million, has endemic problems with gang violence, drug wars and corruption. According to the World Bank, more than 60% of the population lives in poverty, with one in five people living in extreme poverty. The country is led by President Juan Orlando Hernandez - who was re-elected in November 2017 in a contested vote which led to election violence and protests. Jari Dixon, a Honduran politician, Tweeted on Monday (in Spanish) that the caravan was not "seeking the American dream" but "fleeing the Honduras nightmare". Keilin Umana, a pregnant 21 year old in the caravan, told the Associated Press that she had left Honduras because she and her unborn child had been threatened with death at home. 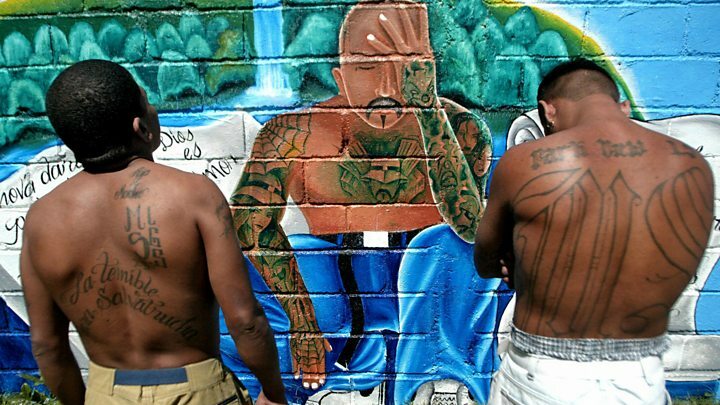 Media caption"Why I joined Central America's brutal MS-13 gang"
Another woman, 24-year-old Andrea Fernandez, who is travelling with three children under seven, told Reuters she could not find work and feared for her family's safety. "We're going to drop in on Donald Trump. He has to take us in," she told the news agency. Earlier this year it was announced that thousands of migrants from Honduras are to lose their temporary protected status within the US by 2020. The group has told the media they are hoping to seek refuge in Mexico or the US. Mexico's migration institute said in a statement on Monday that march participants would have to qualify under immigration rules individually in order to pass through the country. "The law does not provide for any permission to enter the country without meeting the requirements, and then go on to a third country," the government agency said. But the governor of Chiapas state, in southern Mexico, said he would "respect human rights". Governor Manuel Velasco tweeted [in Spanish] that seven hostels were being prepared to receive the migrants and help those in need of medical attention and assistance. US officials are also monitoring the group. On Sunday the US embassy in Honduras said it was "seriously concerned" about the caravan travelling north with "false promises of entering the US". Another large migrant caravan travelling through Mexico earlier this year largely broke up before it could reach the border..
What if they reach the US? There is a legal obligation to hear asylum claims from migrants who have arrived in the US if they say they fear violence in their home countries. Mr Trump's Attorney-General Jeff Sessions says the "credible fear" asylum rule has been exploited in the past, and announced in June that victims of domestic abuse and gang violence would no longer generally qualify under it. In recent weeks, US Customs and Border Protection (CBP) have been accused of deliberately restricting access to ports of entry along the border. The "Turn-back Policy" is currently subject to a lawsuit from the Southern Poverty Law Center, which accuses immigration officials of unlawfully delaying access to the asylum process. The president has been vocal about wanting to reduce migration on the country's southern border, and has overseen a range of "zero-tolerance" measures tightening rules since he took office. Changes to the way detention rules were implemented saw thousands of migrant children detained and separated from their parents earlier this year, sparking national and international condemnation. Mr Trump backed down and signed an order that ended the separation policy in June, but hundreds of children are reported to be still separated from their families.